Passers-by in Tokyo’s busy Akasaka district have started to notice something odd about a 40-floor hotel — it has shrunk to about half its original height.Slowly but surely, and with none of the explosions or dust normally associated with the demolition of skyscrapers, the hotel is being torn down. “In this demolition scheme, the building shrinks and disappears without you noticing,” said Hideki Ichihara, manager of Taisei Corp., the construction firm running the project. 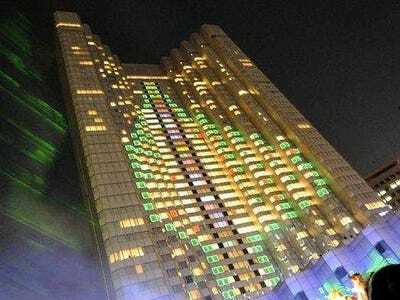 The Grand Prince Hotel Akasaka was built in the 1980s, a gleaming 140-metre (460 feet) symbol of a decade of extravagance when people almost had money to burn and Japan’s red-hot economy powered the world. Now it is shrinking: losing two floors, or 6.4 metres, every 10 days, said Ichihara. The Japanese-developed Taisei Ecological Reproduction System (TECOREP) is a new process designed to contain the noise and dirt of a demolition, and recycle the energy pent up in a tall building. Engineers reinforced the top floor with steel beams and then effectively lopped it off, keeping it in place to be used as an adjustable lid that can be lowered down the building on an external support frame. Workers at the Grand Prince Hotel Akasaka have brought in 15 hydraulic jacks on which this “lid” now sits as they remove one floor at a time, carefully breaking apart the once-luxurious guest rooms. The materials are separated and, where possible, recycled. The waste is lowered through a central well on a pulley system that generates the electricity used to power lighting and ventilation systems, said Ichihara, further reducing the environmental impact of the demolition. The 30-year-old hotel — known locally as “Aka-Puri”, a contraction of the Japanese pronunciation of “Akasaka Prince” — was once a symbol of Tokyo’s glitzy lifestyle. At its height it was the epitome of luxury, with well-heeled guests willing to pay hundreds of dollars for a night in one of its luxury suites, or for its special Christmas Eve packages for lovers. However, the glitter rubbed off Japan’s economy with the bursting of the stock and real estate bubbles at the start of the 1990s. Luxury hotels gradually fell out of favour and some struggled to keep their guest books full. A spokesman for the hotel owner said the company appreciates the quieter and cleaner demolition, which is in keeping with the erstwhile image of the hotel as a landmark. “The Aka-Puri was loved by so many people, and so many people had their weddings there,” said Jugo Yasutake, of Seibu Properties, which plans to build a new hotel and business complex on the spot. The demolition is expected to finish in June.